The programmed animated fountain can be divided into water fountain, dry fountain and indoor bonsai fountain. It water patterns and lights are all controlled by computers. 1.It operates according to preset programs and many different programs will be performed randomly. 2.Good accuracy and high sensitivity are available in this type of fountain. 3.High-performance industrial control computer has been utilized as its user terminal, and the operation interface and control program are equipped inside this computer. The loading operation can be done by controlling frequency changer. 4.It is resistant to impact, dirt and big temperature changes. 5.High adaptability and reliability are available for this program-controlled fountain. 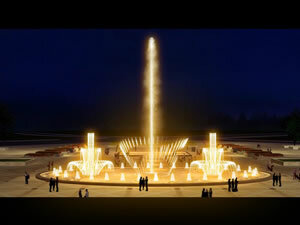 6.The modular structure of the programmed animated fountain simplifies its maintenance as well as its system updating. Established in 1984, Guangzhou Water Art Fountain Irrigation Garden Co., Ltd is a professional manufacturer of programmed animated fountain in China. In addition to programmed animated fountain, we still provide customers worldwide with garden fountain, artificial fog fountain (mist fountain), laser fountain, waterfall rockery, sculpture fountain, wall fountain, waterfall feature, digital water curtain, creek water feature, indoor water fountain, central upright fountain jet, morning glory nozzle, flower fountain jet, dandelion fountain nozzle, fog nozzle, adjustable nozzle, water sphere and hemisphere nozzle, aerated nozzle, spring nozzle, etc. We have built water features for Spring Festival Evening Gala of China, China Art Festival, and many other Chinese literature and art activities. And so far, we have set up long-term cooperation relationship with customers around the world, such as Malaysia, Brunei, Tajikistan, Saudi Arabia, UAE (United Arab Emirates), and many other countries in Central Asia and Southeast Asia. If you're interested in our programmed animated fountain, please contact us freely.